The projections illuminating the facade of the Grandmaster's Palace. The annual Christmas Digital Projections have once again lit up the façade of the Grandmaster’s Palace at Pjazza San Ġorġ for the festive season. 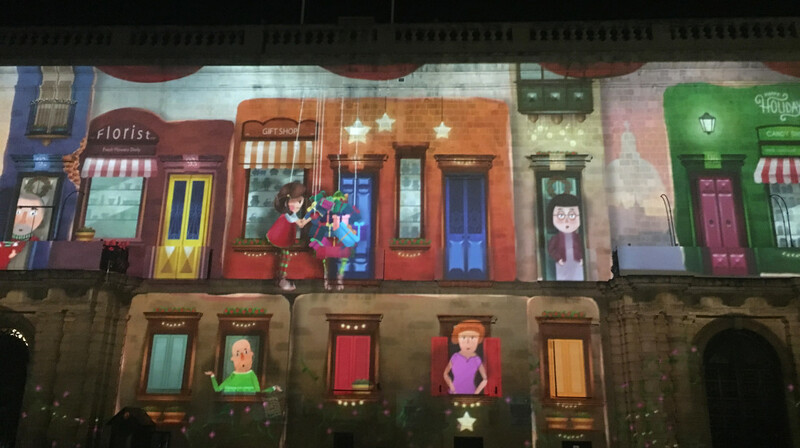 Organised by the Valletta 2018 Foundation in collaboration with the MCAST Institute of Creative Arts, these projections were developed by BA Graphic Design and Interactive Media students. The projections were launched by Her Excellency the President of Malta Marie-Louise Coleiro Preca together with Valletta 2018 Chairman Jason Micallef. The projections revolve around the characters of two siblings, Ġorġ, the youngest, and Nina, the eldest. While handing out presents happily to Valletta’s residents under Nina’s direction, a present gets lost following an argument between the siblings. Ġorġ goes in search for it at the bottom of sea and must try to get it back in time for Christmas. The projections are on at Pjazza San Ġorġ from the 23rd-30th December, starting at 6pm and running every 30 minutes till 11pm. A final show is also scheduled for the 31st December to usher in the New Year as part of Valletta’s New Year’s Eve festivities.